The more we learn about impatiens downy mildew (IDM), the more intriguing and cunning this disease seems. It came to light in 2004 after widespread infections were reported in several states throughout the US but then receded from the spotlight for several years. Since 2011, IDM has been more consistently visible and frustratingly present in both production systems and landscapes. As a consequence, sales of impatiens declined. The USDA’s National Agricultural Statistics Service estimated annual sales of impatiens dropped from over $266 million in 2009 to just under $215 million in 2014. During this time, impatiens went from being the most valuable bedding plant (in terms of total, annual sales) to the third most valuable and was surpassed by petunias and geraniums. To better understand Plasmopara obduscens, the causal agent of IDM, and, therefore, better manage the disease, researchers need to have a better understanding of its past. It turns out that impatiens downy mildew has a unique, confounding history. P. obduscens was first reported in the US in the 1880’s on Impatiens capensis, a native impatiens known to be weedy often called orange jewelweed. I. pallida, another type of jewelweed, was also determined as an early host plant. I. walleriana, the most well-known, common host of IDM, was introduced to the US in the 1960’s, and is by far considered the most susceptible of all species tested. But IDM didn’t become problematic until 2004. So what changed? A team of researchers, led by Dr. Cristi Palmer, IR-4 Environmental Horticulture Program, is trying to solve the IDM mystery. One of the researchers, Dr. Jo Anne Crouch, USDA ARS, is trying to pinpoint the cause for the sudden change. By using molecular techniques, Dr. Catalina Salgado-Salazar, a post doc with Dr. Crouch at USDA ARS, is comparing populations of P. obduscens collected in the 1880’s with more modern ones collected during recent IDM epidemics. Early results indicate that historic isolates are distinctly different. Dr. Salgado-Salazar believes modern isolates are not derived from historic ones; however, their origin is unknown. Her results also indicate that the current population of this pathogen continues to evolve. Why does this research matter? 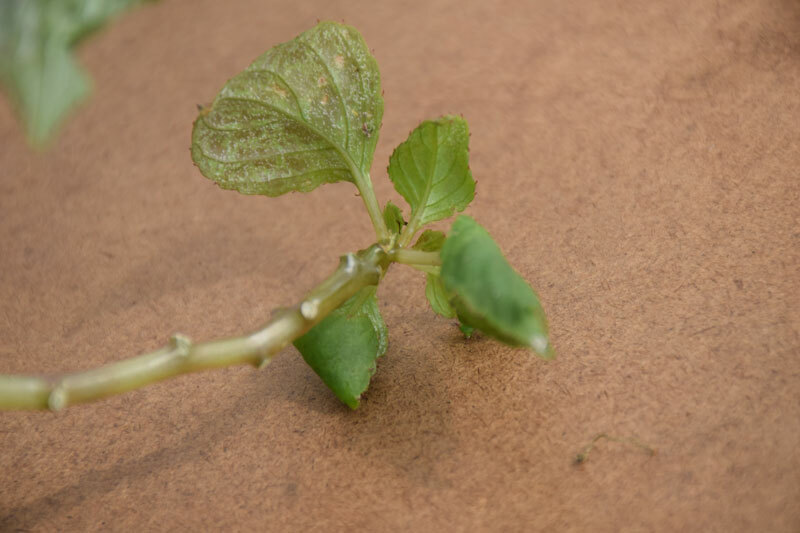 A shifty pathogen, such as P. obduscens is proving to be, impacts fungicide resistance management strategies, diagnostic tools, and creates obstacles for breeders. At-risk pathogens are those that have short disease cycles and are capable of undergoing many disease cycles per year. They are generally able to quickly adapt to new environments and overcome fitness challenges, such as tolerance to fungicides. IDM fits this definition. The common ‘white powder’ visible on leaf undersides of infected impatiens is comprised of lots and lots of sporangia (a type of spore spread readily by air currents, splashing water, and movement of plant material). All those sporangia can be easily transmitted to cause new infections. Reduced efficacy has been reported with a couple of fungicides. Populations of P. obduscens in certain regions have noted that either Subdue Maxx™ (mefenoxam) and/or Adorn™ (fluopicolide) no longer work as well in previous years, potentially signaling fungicide resistance development. Furthermore, plant injury has been associated with Adorn™ drench applications related to perlite-based media. Product information is in no way a product endorsement. Please consult product registration and label for the most current use information. Another key aspect to unlocking better management tools is simply having more information about IDM’s life and disease cycles. Dr. Nina Shishkoff, USDA ARS, is trying to decipher some basic, biological questions about the pathogen. For example, the primary source of inoculum is unknown. Dr. Shishkoff is studying the possibility that P. obduscens is seedborne, the importance of systemic infections, and the survivability of oospores (thick-walled resting spores) in the soil. Oospores from other downy mildew species have been shown to remain viable after 8-10 years in the soil, which influences landscape management. Host range is an important component to research. Like most downy mildews, IDM is host-specific, which means that impatiens is the only known host of P. obduscens. There are an estimated 1,300 species of impatiens, and a clear range of susceptibility levels has emerged. For example, New Guinea impatiens (Impatiens x hawkeri) are tolerant of IDM but do not do as well in full shade. On the opposite end of the spectrum are varieties of I. walleriana, a species considered to be unnaturally susceptible to the extreme. Evaluations led by Ms. Daughtrey include the many, many different species in between. These studies will yield information helpful to breeding efforts to develop impatiens varieties resistant to IDM that also grow well in shade conditions and bloom all season. A tremendous amount of research on IDM has been done to date, but many questions still need to be answered for our industry to have a better understanding of its management. Meanwhile, impatiens sales have rebounded to pre-2011 levels, according to some in the industry. Just remember that IDM may still be lurking in the shadows. 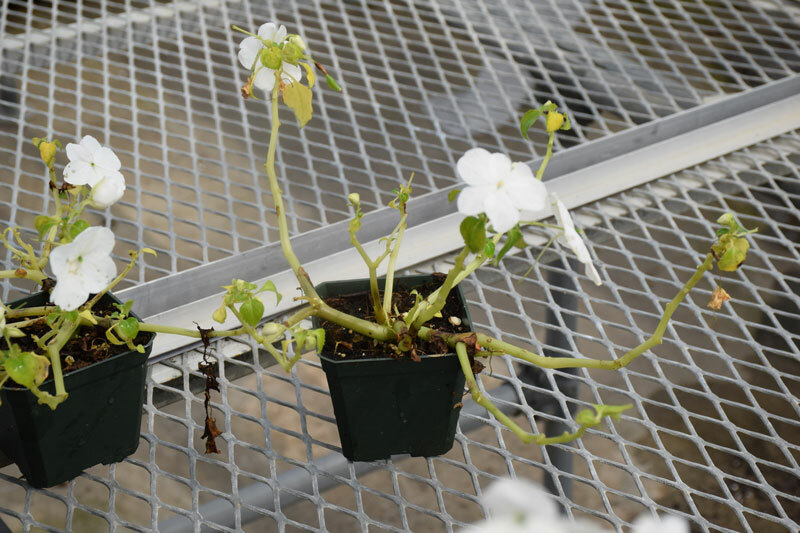 Since 2013, over $2.2 million dollars has been allocated to downy mildew research, including on impatiens, from both Farm Bill Section 10007 (USDA APHIS) and the Floriculture and Nursery Research Initiative (USDA ARS). 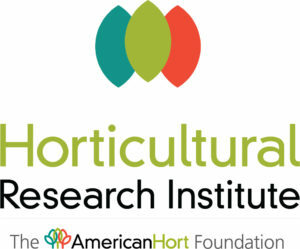 AmericanHort and its affiliate, the Horticultural Research Institute (HRI) supported funding of this research. The IR-4 Ornamental Horticulture Program, a USDA-NIFA sponsored entity to increase the specialty crop industry’s access to labeled control products, coordinates this collaboration of researchers. Jill M. Calabro, Ph.D. is science and research programs director at the Horticultural Research Institute, the AmericanHort research and scholarship foundation. For more information about HRI, its grant-funded research, or programming, visit www.hriresearch.org or call 614-884-1155.